A fun navy blue T-shirt by Joules made in comfortable cotton jersey. 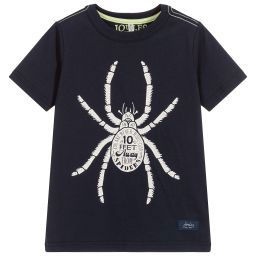 A distressed-effect spider is printed on the front with the words ' you are never more than 10 feet away from spiders'. It has pale green over-stitching on the shoulders and back of the neck.